Who doesn’t love the classic 1980s film, Scarface? 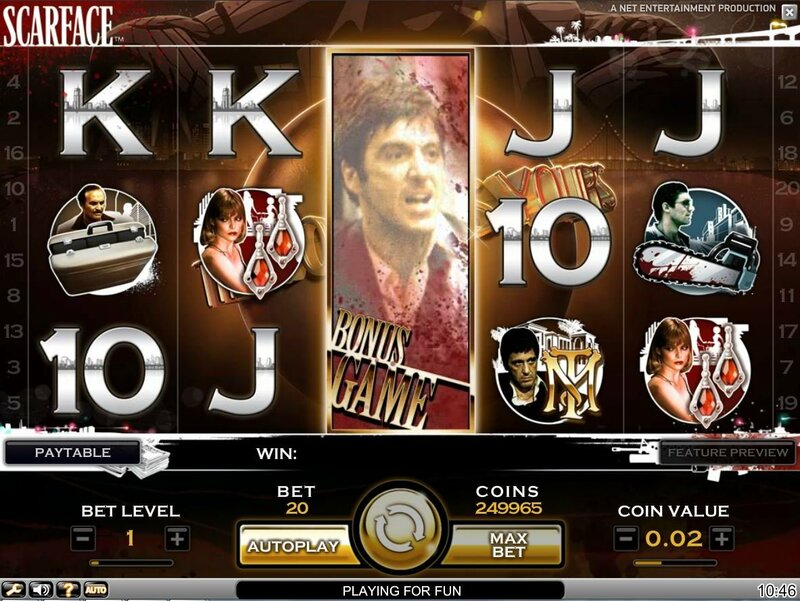 Experience the drama and suspense of Tony Montana as he rises to power with the 5-reel, 20-payline Scarface video slot. 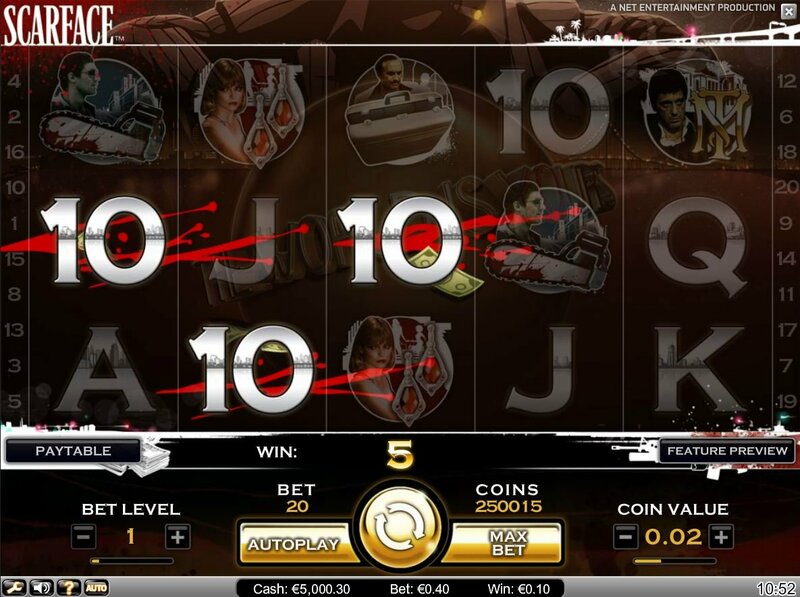 Powered by Netent, you’re sure to love the Scarface slot machine! 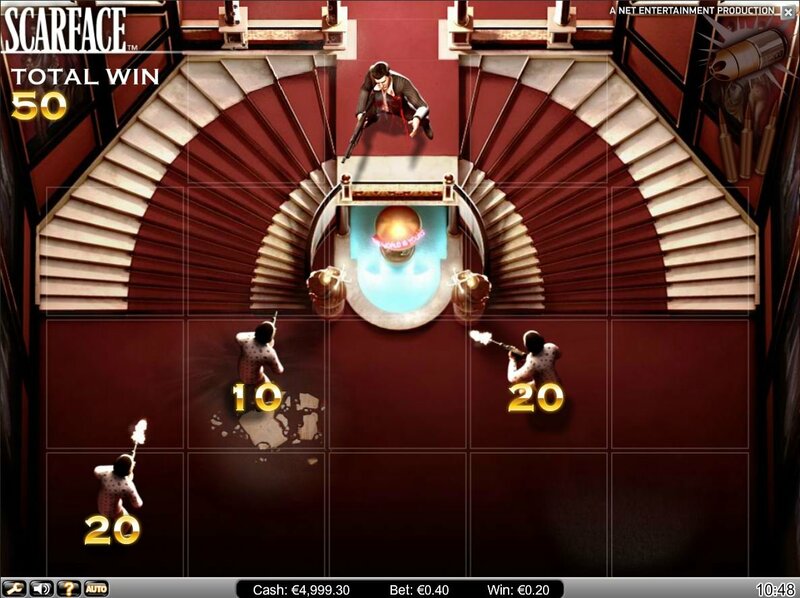 The Scarface slot game starts out with a great opening intro featuring cool clips from the movie. Enjoy the suspenseful sound effects. In addition, the game graphics look superb. The reels feature high-quality images of characters from the movie which animate during winning combinations. During the Bonus Game you return to the movie’s famous last stand shoot-out scene in the grand lobby. Shoot at the correct targets and stay alive long enough to collect as many bonus points as possible. Keep spinning and soon, the world could be yours! The Tony Montana Stacked Wild appearing on reel 3 activates the Scarface Slot Bonus Game. During the Bonus Game you return to the movie’s famous last stand shoot-out scene in the grand lobby. Shoot at the correct targets and stay alive long enough to collect as many bonus points as possible. Keep spinning and soon, the world could be yours! Tony Montana’s right hand man, Manny serves as a Stacked Wild. This symbol substitutes for all symbols except other Stacked Wilds. When a full Stacked Wild appears on the second reel, the nudge spin activates. During a Nudge Spin, the Nudge Wild stays while the other reels spin again for a chance at bigger wins. Michelle Pfieffer who played Tony Montana’s wife, Elvira serves a Stacked Wild. When her symbol appears on reel 4, 15 free spins activate.